Alright, now you’re all set and ready to begin planning this quick summer getaway. Let’s start with finding the top 10 things to do in Barbados. 1. Barbados Cruise Excursions: Your cruise company will have a list of excursions to select from and you can sign up before or during your vacation. Options will range from ATV and Segway tours, kayak and snorkeling with sea turtles day trips and city walking tours. 2. Visit the Beach: Barbados has over 30 world class beaches, known for their powder white sand and calm water perfect for swimming. The best places to take a dip and cool down from the hot Caribbean sun are Accra, Crane, or Sandy Beaches. 3. Take in a festival: The people of Barbados love a great celebration and all types of festivals are scheduled throughout the entire year. There are music, food and dance festivals. The Reggae Festival occurs in late April; Barbados Wine, Food and Rum Festival takes place in November and the Crop Over Festival happens each May. 4. Try surfing: While the majority of the island has perfect sea conditions to float on a water mat undisturbed by waves, the east coast of the island is dramatically different. 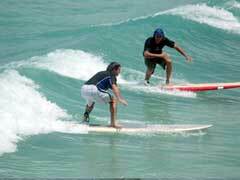 Weather patterns show rough seas and high waves, which are excellent conditions for surfing and hanging ten. We’re halfway through our top ten list and who knew there were so many interesting things to do in Barbados. These Southern Caribbean cruises aren’t like the ones your grandparents took on their honeymoon. With more adventure and thrill seeking activities, taking a cruise to simply stay on board and sip Mai Tai all week long are a thing of the past because there are so many cool things to do in Barbados. 5. Stroll down the South Coast Boardwalk: The new boardwalk is home to several restaurants, electrifying nightlife and a variety of hotels. 6. Take a ride on a Jet ski: No reason not to enjoy the Caribbean Sea to the fullest. You’ve come all this way, so why not jump in, get wet and hold on as your jet ski propels you through the water at top speeds. 7. Go horseback riding: Let your horse trot or gallop along the beautiful coast of Barbados. This rustic tour can be arranged on your ship or when you arrive in port. 8. Got Oxygen? : Go scuba diving. Barbados is known for its shipwreck and reef diving spots. If you are a certified diver, you’ll enjoy diving to explore the S.S. Stavronikita and the Shark Bank reef. 9. Sample the Rum: Locals claim that no trip to Barbados is complete without having a glass of Rum Punch while lounging around a balmy Barbadian beach. 10. Don’t leave without seeing a sunset, it’s the moment when you’re breath will be taken away. Today’s Barbados vacation packages are hands on and interactive, enhancing your experience and creating amazing moments and memories. As you can see there are plenty of exciting things to do in Barbados. Cruise booked…check. Plan of things to do…check. All that’s left is to pack, head out and enjoy your vacation.